London Calling: Oldest Handwritten Documents In British History Discovered : The Two-Way Notes, bills and contracts dating to as early as A.D. 43 were discovered during work on a new building in London. The wooden tablets mention debts, legal disputes and one Tertius the Brewer. 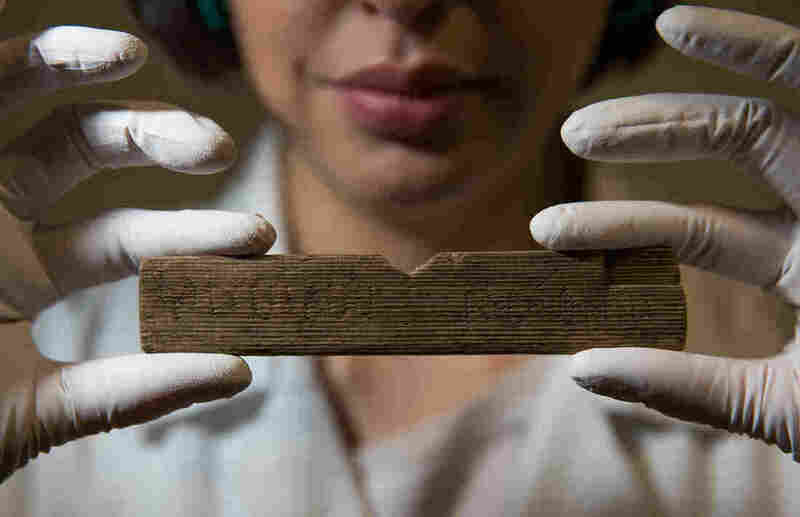 Archaeological conservator Luisa Duarte holds a Roman waxed writing tablet at Bloomberg's London offices on Wednesday. This tablet contains the earliest written reference to London, dated A.D. 65-80; it reads "Londinio Mogontio" -- that is, "in London, to Mogontius." The discovery, a collection of more than 400 Roman waxed writing tablets, was announced Wednesday by the Museum of London Archaeology. The tablets were unearthed in London's financial district during excavation work for a new building. "The tablets were found under a 1950s office block in the still smelly, wet mud of the lost river Walbrook, as the site was being cleared for a huge new European headquarters for Bloomberg.
" 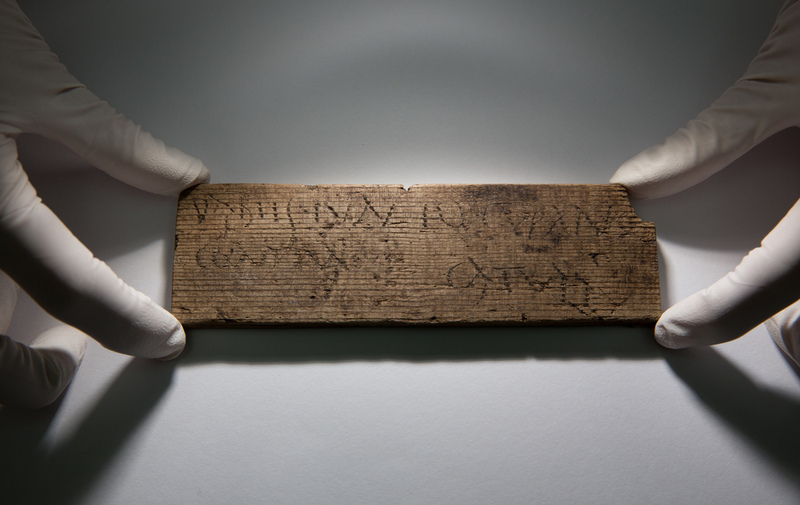 'They give us a glimpse into a carpet-bagging community in the new wild west frontier of the Roman empire,' said Roger Tomlin, the expert on early Roman writing who spent a year poring over the faint scratches on slivers of fir wood recycled from old barrels. The Bloomberg tablets, as the museum is calling them, date back to as early as A.D. 43. 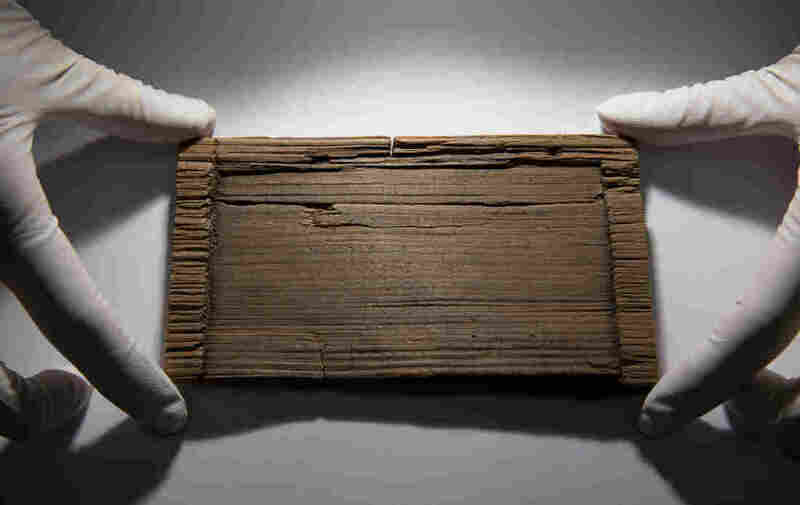 The tablets survived nearly two millennia because the wet mud blocked oxygen from reaching the wood and protected them from decay, the Museum of London Archaeology writes. Most of the tablets appear to have been trash brought in to use as a sort of landfill when Romans were building on top of one-time Walbrook River (now completely underground), the Guardian reports. Some legal documents, though, were concentrated in a small room — possibly the oldest law office in Britain. All the tablets were originally coated in black beeswax, on which messages were written. The wax has long since been lost — but the stylus that was used to mark the tablet sometimes cut down into the wood, leaving marks behind. Think of how a pad of paper can retain the imprint of a message from a page that's been torn away. But it wasn't easy to read those accidental markings. "As tablets were reused, in some cases several layers of text built up on the tablets, making them particularly challenging to decode," the museum says. This Roman waxed writing tablet, dated A.D. 80-90/5, reads "You will give [this] to Junius the cooper, opposite [the house of] Catullus." Other tablets provide tantalizing hints to life in first-century London. "Tertius the brewer is almost certainly Domitius Tertius Bracearius, who is also known from a writing tablet found at Carlisle — and so by about AD85 had a business stretching the length of the new Roman territory. Only the outer flap of the tablet survives, addressed to him." "One tablet is a contract from October 21, 62 AD, to bring 'twenty loads of provisions' from Verulamium — modern day St Albans, Hertfordshire — to London, a year after the revolt by Iceni queen Boudica. "Experts said the contract reveals the rapid recovery of Roman London after it was burned in the Boudican revolt." One tablet was written by a judge to two people (not Roman citizens) who had a legal dispute, according to a video from Bloomberg. The video also shows how the cursive Latin was decoded, and it demonstrates how a wax tablet would originally have looked and been used. About 100 names are legible on the 80-odd tablets interpreted so far, according to the museum. In addition to the judge and Tertius the brewer, there's a cooper (a barrel-maker) and numerous slaves, soldiers and freedmen. Before this discovery, the museum says, archaeologists knew of only 19 readable wax tablets from Roman-era London. Archaeologist Sophie Jackson called the find "hugely significant," The Associated Press writes. "It's the first generation of Londoners speaking to us," she said.